Fresco from the Church of the Holy Apostles, Peć. I have just come across a document that gives information to supplement a recent post about Demetrios Laskaris Asan. Asan was an exceptionally unpleasant individual -- perhaps not exceptional among Moreote archons -- but this shifts the perspective. In Lambros' Παλαιολόγεια καὶ Πελοπονησιακά, Vol. 1, I discovered excerpts from a letter of consolation by John Dokeianos to Asan, and find that he had lost three sons, two of them fighting against enemies and infidels. I haven't been able to work out a satisfactory date for this letter and would be grateful for any information or suggestions. Dokeianos weeps for the loss of these splendid sons: for the first who shared every wonderful quality, for golden-souled Alexios, for the third and most beautiful whose name reflected the grace with which he was endowed. The first two died contending for the fatherland. The third, who died in the prime of his life, martyr to a principled decision, left behind children and a widow: he will be added to the choir of martyrs. It is a very short document. There are no pictures of Maria, or Marie, d"Enghein, or d'Enguino, or any of six other spellings, but a hundred years ago, the occasional writer on medieval Greece and Nauplion tried to make some sort of romantic picture of her as Lady of Nauplion, summering in a pretty tower across the bay. That tower was built by the Turks,centuries later, and although she did "own" Nauplion and Argos for a few years, there is no direct evidence that she actually was ever there. But she may have been. Modern historians rush right past her as unimportant. Except that without her signature on a document, Venice might not have acquired Argos and Nauplion. Maria was born in 1364, the only child of Guy d'Enghein, Lord of Argos, Nauplion, and Kiveri, and his wife, Bonne de Foucherolles, daughter of the Enghein governor of Argos. So it is very likely that Maria spent her youth in Nauplion and Argos. She was betrothed at the age of 7 to a John de Lluria, probably the son of the Navarrese ruler of the Principality of Achaia. This marriage would have united the western near-half of the Morea with the Argolid, and would have intensely antagonized the Venetians in the south, the Byzantine Despotate of the Morea, and the Florentine Duchy of Corinth. There are no documents for the interval, but one has to assume that Venice which had merchants in Nauplion and Argos had noticed the excellence of its port and the fine fortifications of both cities. At some point Guy acquired citizenship in Venice, and possibly a house. Guy died in 1377. It should surprise no one to learn that two Greek archons with houses in Nauplion, a Kamateros and a Kaloethos, petitioned Venice for her to marry a Venetian, specifically Piero Cornaro, son of Frederigo, the wealthiest man in Venice, who had an abiding interest in the security of his trade interests in Greece. 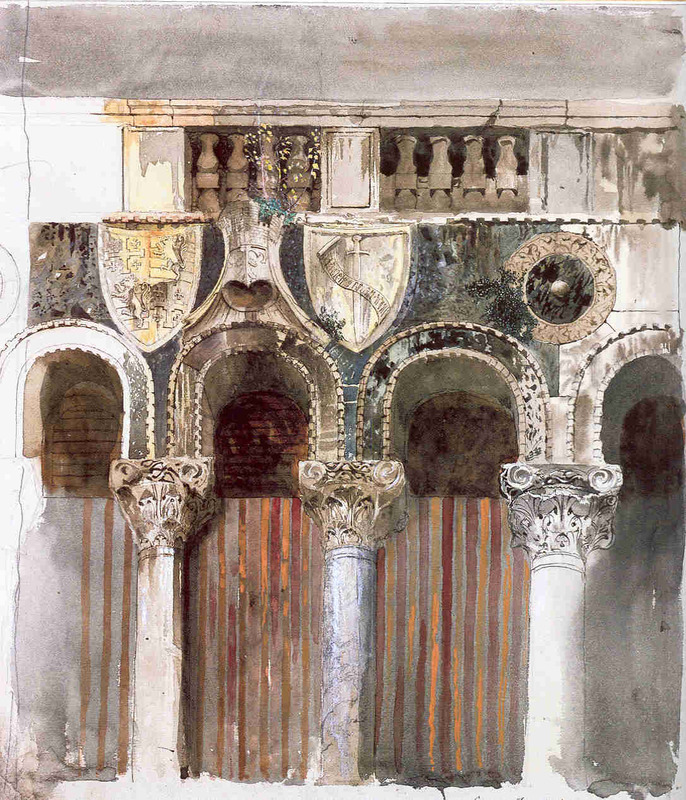 The petition was brought to Venice by Giovanni Gradenigo, one of the Venetian merchants of Nauplion. It explained that everyone there was concerned lest Nauplion be taken over by Theodoros I, Despot of Mistra, or "that cruel tyrant" Nerio Acciaiuoli. A Greek chronicler tells us that Kamateros and Kaloethos received large gifts for their concern. Maria was married to Piero that same year in Venice. The senate kindly provided a galley to take Piero out to govern Nauplion on her behalf. She presumably remained under the supervision of her father-in-law. In November 1381, the senate kindly provided a galley to protect Nauplion against the frequent Ottoman pirate raids. There is another seven years of no information. In 1388 Piero died. Maria was a widow at the age of 24. Nauplion petitioned that Venice take the Argolid into her tender care, since a young and grieving woman could not possibly be expected to manage such responsibility. We have the contemporary Venetian copies of two documents that Maria signed on 12 December 1388, "in the house of the late Frederigo Cornaro." One transfers her castles, places, fortresses, districts, pertinences, and jurisdictions of Argos and Nauplion on behalf of herself and any heirs, to Leonardo Dandolo, "noble and wise man, knight, honorable procurator of S. Marco," acting on behalf of Venice. The second document said that Maria would receive for this an annuity in perpetuity of 500 gold ducats for herself and her heirs (and since her husband had been away for years the chances of heirs were fragile), and an additional annuity of 200 gold ducats for herself for life, and should she not have heirs, the right to bequeath 2000 gold ducats to anyone she pleased, payable out of the Venetian treasury, in her will. And she would forfeit all of this should she marry anyone not a Venetian patrician. Now, both these documents say that she is "over the age of fourteen and under the age of twenty-five." She was twenty-four and everyone knew it. What that means is that she was old enough to be married, but not of an age to legally transfer property. Twenty-five was the legal age for a woman to transfer property. This has not before been noticed by anyone writing on the subject, and it seemed not to be an issue for the notaries present, or for Dandolo, or for the Doge and commune of Venice. All these legalistic public servants managed completely to ignore the law, Nauplion and Argos came under Venetian control, and 1388 entered the list of important dates in Nauplion's history. A young woman with 700 gold ducats a year of her own was highly desirable as a wife, and she shortly was married to Pasquale Zane, about whom we know nothing other than that he died in 1392. We do not know why, nor do we know the cause of her death in 1393 at the age of 29. Nor do we know what happened to that 2000 gold ducats she could bequeath. 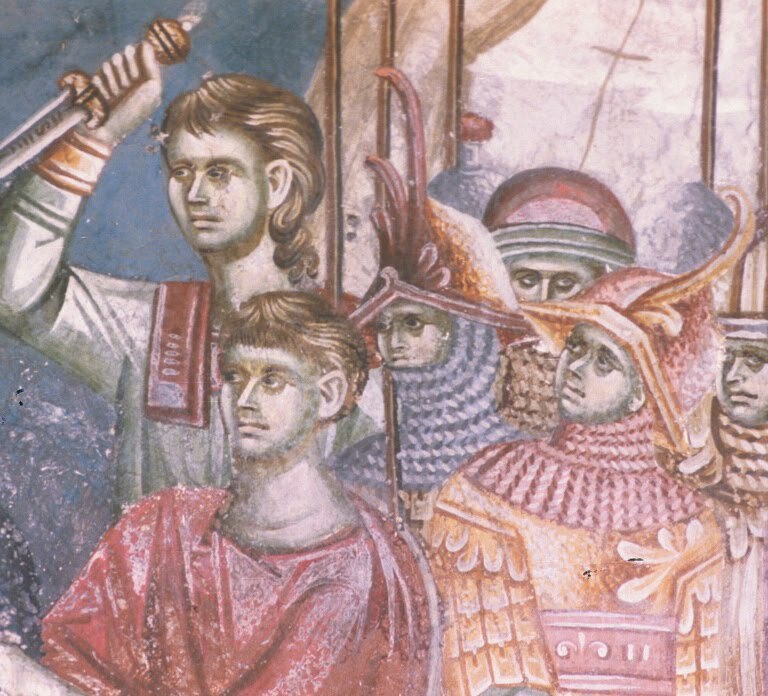 However, in 1388, upon hearing of Piero's death, Theodoros of Mistra immediately came up with troops and occupied Argos. He probably learned of the death within four days, while it would have taken a month, even two, for the news to reach Venice. Theodoros did not move on Nauplion, having no ships of his own which would have been needed for defense. [Late correction: he apparently did try a siege of Nauplion but Venice was able to keep it supplied by ship.] There were several years of mild war and bickering on the matter, which is a topic for another blog. The last item in Maria's story occurred in August 1393, when the Venetian senate received a letter from her uncle, Englebert d"Enghein of Bruges, who said that he was technically Maria's heir, and he would like to have Nauplion and Argos. The senate replied mildly that he could have them, just as soon as he reimbursed them for the expense they had been put to in the acquisition and defense of the territory. The picture above is Ruskin's watercolor of Frederigo Cornaro's house in Venice, now Ca'Loredan which, with Ca' Farsetti, is now the seat of the government of Venice and the Veneto. This is where Maria lived. Late comment: An anonymous commenter -- and I have asked that comments NOT be anonymous, complains about my spelling. It is a meaningless comment under the circumstances: spellings in contemporary documents include, but are not limited to: d'Erigano, d'Anguein, d'Enghein, Dagyhein, Daghein, Enquien. Fletcher is missing. There is no picture of William Fletcher. Two hundred years ago this July, George Gordon, Lord Byron (left), and John Cam Hobhouse, Lord Broughton (right), were starting their travels in the Morea. "We had only one English servant with us, who was my friend's valet; for I was fortunately disapointed the day before I left London, of the man who was to have accompanied me in our travels: I say fortunately, because English servants are rather an incumbrance than a use in the Levant, as they require better accommodation than their master, and are a perpetual source of blunders, quarrels, and delays. Their inaptitude at acquiring any foreign language is, besides, invincible, and seems more stupid in a country where many of the common people speak three, and some four or five languages." "I cannot find that [Fletcher] is any loss, being tolerably master of the Italian & modern Greek languages, which last I am also studying with a master, I can order and discourse more than enough for a reasonable man. ----Besides the perpetual lamentations after beef & beer, the stupid bigotted contempt for every thing foreign, and insurmountable incapacity of acquiring even a few words of any language, rendered him like all other English servants, an incumbrance. ----I do assure you the plague of speaking for him, the comforts he required (more than myself by far) the pilaws (a Turkish dish of rice & meat) which he could not eat, the wines which he could not drink, the beds where he could not sleep, and the long list of calamities such as stumbling horses, want of tea!!! &c. which assailed him, would have made a lasting source of laughter to a spectator, and of inconvenience to a Master. ----After all the man is honest and in Christendom capable enough, but in Turkey--Lord forgive me, my Albanian soldiers, my Tartars & Janizary worked for him & us too as my friend Hobhouse can testify." "Our baggage was weighty; but, I believe, we could not have done well with less, as a large quantity of linen is necessary for those who are much at sea, or travel so fast as not to be able to have their clothes washed. Besides four large leathern trunks, weighing about eighty pounds when full, and three smaller trunks, we had a canteen, which is quite indispensable; three beds, with bedding, and two light wooden bedsteads. The latter article some travellers do not carry with them; but it contributes so much to comfort and health, as to be very recommendable. We heard, indeed, that in Asiatic Turkey you cannot make use of bedsteads, being always lodged in the khans or inns; but in Europe, where you put up in cottages and private houses, they are always serviceable, preserving you from vermin, and the damp of mud floors, and possessing advantages which overbalance the evils caused by the delays of half an hour in packing and taking them to pieces. "We were also furnished with four English saddles and bridles, which was a most fortunate circumstance, for we should not have been able to ride on the high wooden pack-saddles of the Turkish post horses; and though we might have bought good Turkish saddles, both my Friend and myself found them a very uncomfortable seat for any other pace than a walk. "Whilst on the article of equipage, I must tell you, that as all the baggage is carried on horses, it is necessary to provide sacks to carry all your articles. These sacks you can get of a very useful kind in the country. They are made of three coats; the inner one of waxed canvas, the second of horse-hair cloth, and the outward of leather. Those which we bought at Ioannina were large enough to hold, each of them a bed, a large trunk, and one or two small articles; and they swing like panniers at each side of the horse. "Some travellers prefer a large pair of saddle-bags, and to have a large chest or trunk, which they send round by sea to meet them, or leave at one fixed spot; but this is a bad plan: the saddle bags will not carry things enough for you; and then to have your wardrobe at any fixed spot, binds you to one route, and prevents you from taking advantage of opportunities." So if you are fortunate enough to be traveling in the Morea this summer, take a moment of silence for Fletcher. This is a catalog of my twelve public finds, not counting one whose photograph has gone missing. 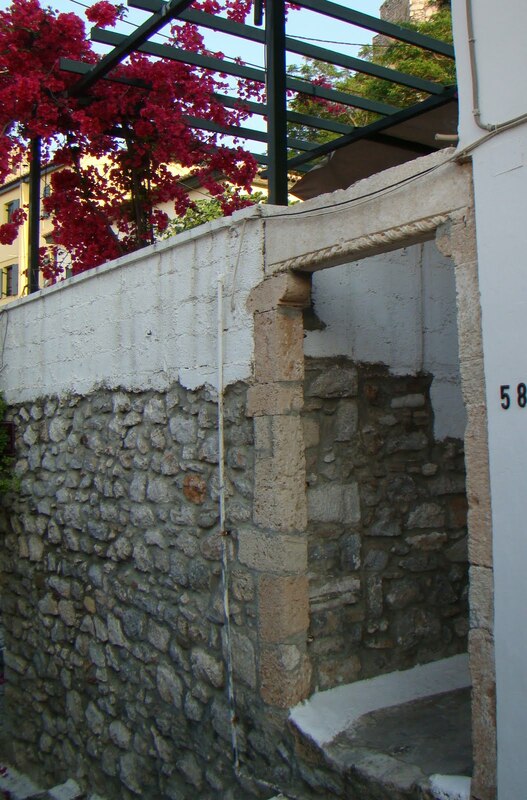 The first, and best, is the Byzantine lintel of the garden entrance you see above, at the right of the top of the stairs to Akro-Nauplion. You can see a similar usage of two pieces, one classical and one Turkish, over the door of the house under the platan tree on the plateia. 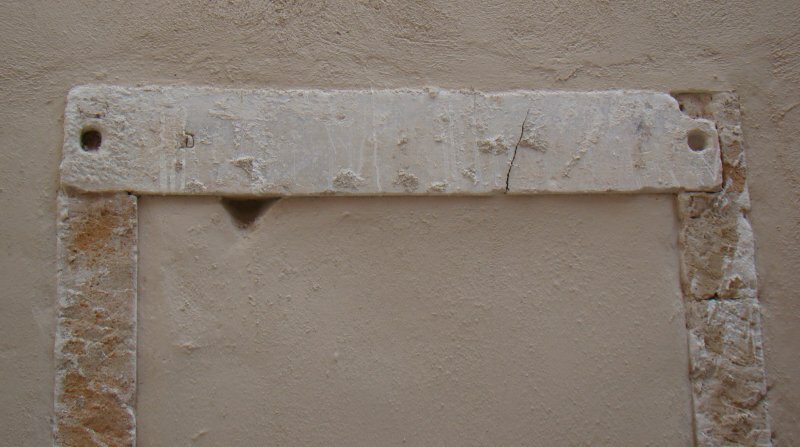 The initials of the builder of the house, and the date, 1878, have been added to the Turkish slab. At the other end of the plateia are the four late-antique capitals of the columns of the little mosque built soon after the Turks acquired Nauplion in 1540. 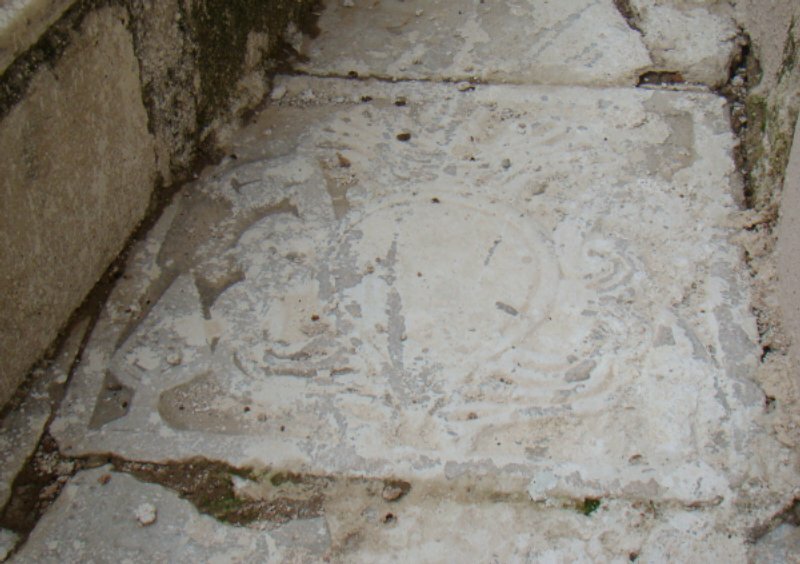 One I particularly like -- this is the picture I don't have -- is a house on the main cross-street where a Turkish block with carved rosettes has been sawn in half length-wise and the halves used to support windows. The halving was not done at perfect right angles and the slight slant to each piece is beguiling. 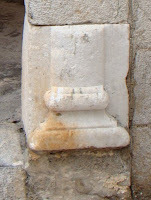 At the top of the the stairs on the hillside in the little neighborhood above the bus station is this classical lintel. It does not quite cover the whole space that it should, but the piece was more important than correct construction. The capitals are confusing. 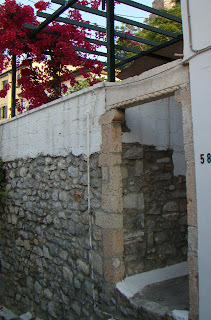 On the north side of the Panagia church, beside the red cafe, a classical door step has been used for the lintel of a window, unattractive but significant -- significant building elements have been left uncovered all over the outside of Panagia. You can see in this lintel the holes for the pivots of the doors. Behind Panagia, among the graves, is a stone I am unsure about, but it seems to be a Venetian shield to which Turkish cypress trees have been added. 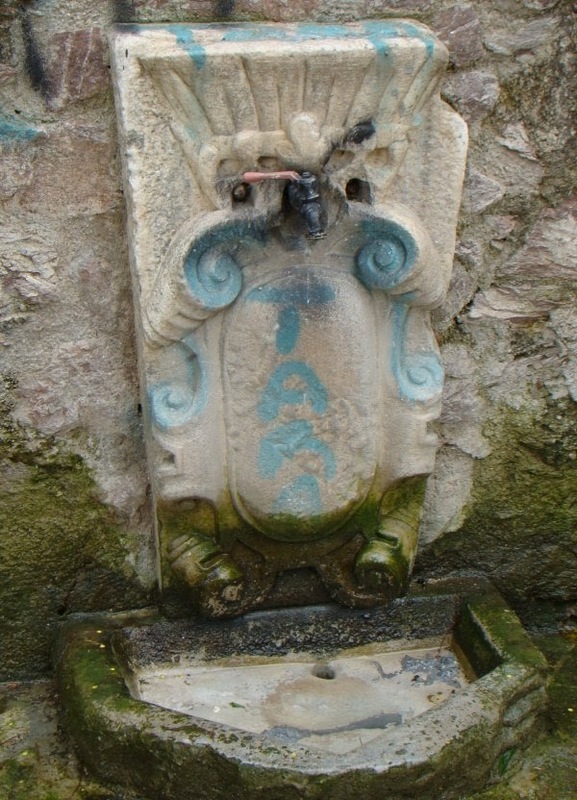 Finally, two shields once used for fountains, one Turkish, one Venetian. 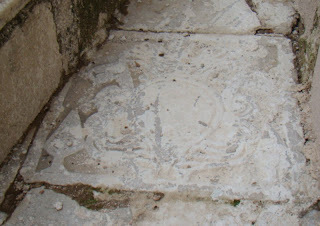 The Turkish one has a little turban, and what appears to be a most remarkable smiling sun rising over clouds or rocks. The Venetian dates from around 1700 and the surface has been uniformly chipped to remove any images. I think the blue works well. Should you find other spolia, please let me know. A reader has sent his spolia collection and you can see them here. Because one of our finest poets, W. S. Merwin, has just been appointed as Poet Laureate of the United States, I want to take the opportunity to print one of his finest poems, Piere Vidal. I have had it on my website for the last eight years. Piere Vidal was a troubador (d. 1205) and the text is based on his vida, his own account of his life. Ezra Pound wrote another version of the Vidal text (p. 16 here), and although it retains some of the spirit of the original, it has Pound's typical self-indulgence, and nothing of Merwin's controlled fire. It is worth comparing the simplicity of Merwin's vocabulary with Pound's use of the thesaurus. Interestingly, it was Pound who told the young Merwin that he needed to study the troubadours. its day and it was nothing to you where were you. Both images here are manuscript "portraits" of Piere Vidal. The original music and text of Vidal's vida can be heard on "Troubadors" by the Clemencic Consort (also from Amazon). Another Vidal song, "Pos tornatz sui em Proensa," is performed on Paul Hillier's Proensa. Both CDs contain the original texts. W. S. Merwin has an elegant small book of essays on Provencal and the troubador Bernart de Ventadorn in particular, The Mays of Ventadorn.